Chinese babi pangang, crispy pieces of meat with a delicious sweet sauce, like you can get at a take out at the Dutch Chinese. Fastfood, homemade and delicious. Like the Chinese omelette with sauce that I made in the context of my bucket list last week, I had another recipe I’d love to make at that list. A Chinese Babi Pangang recipe, with crispy pieces of meat with a delicious sweet sauce, which you can obtain from the Chinese. A kind of fast food so. Is it also a fast food if you make it yourself? In terms of preparation it certainly is, because you don’t have that much activity. Just to get that crispy on the Babi Pangang, you should grill for half an hour. But then you do have a slimmer version than the Chinese, where they fry the Babi Pangang. And drive up and down to the Chinese, that takes half an hour to, right? Babi Pangang is an Indonesian recipe, which literally means grilled pork. That’s how it’s often prepared in Indonesia is. Over a wood fire pork it’s grilled until done. In the Netherlands usually bacon pork steaks are used and sometimes gammon steak are used in the preparation of the Babi Pangang. Which are first baked and then deep fried. The meat is topped with a sweet and sour sauce. Make a marinade with half the chopped onion, garlic, ginger sauce, sambal and 2 tablespoons soy sauce. Rub the meat with the marinade. Heat 2 tablespoons oil in a pan and fry the meat brown. Put the meat in a baking dish and place the meat in the oven. Let it roast for 20 minutes. Then put the grill and grill the meat for 15 minutes. Meanwhile, heat the oil in a pan and fry the rest of the onion. Stir in the tomato puree and stir to join two minutes until he begins to smell sweet. Add the sherry, remaining soy sauce, brown sugar, vinegar, curry and 200 ml of water and mix well. Whisk the cornstarch with 2 tablespoons water to a paste and mix that into the sauce. Remove the meat from the oven and pour the sauce over the meat. Bolognese, a tomato meat sauce and often used as a topping on your spaghetti. But did you know you can make a delicious quiche with it? An Italian buffet without bolognese sauce? Of course it works, but in this buffet I want to use it in a dish. 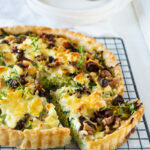 And today I used the sauce a bit different into a delicious quiche. And did I make it up all by myself? A bit, but it’s adapted from an idea form a recipe on AH.nl (called quiche bolognese) and I thought it was a great idea, except …. in this dish a sack with instant bolognese mix for spaghetti was used for the quiche. I don’t like to use sacks. So I tought could be better! And really that doens’t take a lot of effort and it takes you 20 minutes of extra time. In that time you get a rich tomato sauce with a great slight sweet taste… And after tasting it you won’t buy the sack anymore! Of course you can use for fresh tomatoes (500 grams) for this dish for the sauce. But, as with many fruits and vegetables, tomatoes are great when in season but in the other seasons they are watery and have less flavor. To ensure a good quality you can use canned tomatoes. So you get a consistent quality of your sauce. Before you add the tomato paste to the sauce, fry it briefly in a skillet. Why? Smell raw tomatopaste. It smells sour and it tastes the same way too. When you cook it for 2 minutes in a skillet the smell will change and the taste becomes sweet. And that is a great addition in this sauce. In this sauce you use a little bit of sugar. Tomatoes have a slightly sweet undertone. By adding a little sugar, the sweet taste will get stronger. And that is very tasty. (If you ever cook fresh carrots, the carrots becomes so much sweeter by adding a pinch of sugar). Do not use puff pastry for this recipe, but savory pie dough. The buttery puff of fits less well in this recipe. Also it gots a lot of extra calories that aren’t really necessary. Make the quiches and bake them for 15 minutes. Let the quiches cool to room temperature and put them in a freezer bag (place a sheet of baking paper between the quiches). Freeze the quiches. 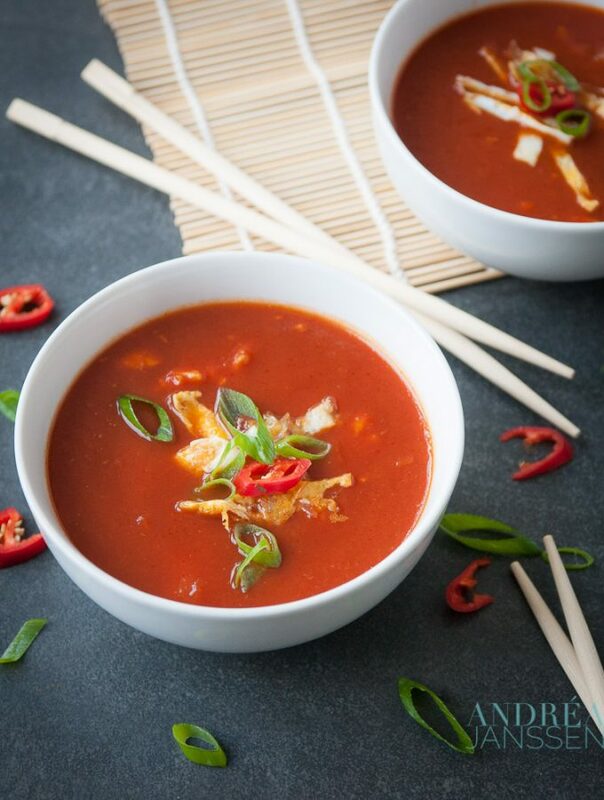 When we used to eat Chinese when I was very little (and that was not often), I always asked my father to bring a bowl of Chinese tomato soup. I was just so crazy about it, and still am. And although I have searched for this recipe in very many cookbooks, I still had not found it. At the foodblogswap this month I was designated to cook from the blog of Melissa (sunshine in my kitchen (Dutch blog)). I am a fan of the Kitchen Aid (yes I can hardly live without) and she has all kinds of delicious recipes on her blog. And then my eye fell on the Chinese tomato soup. Would this then be THE recipe. And indeed it was, this soup tastes the same as the Chinese tomato soup which you can order at the Dutch Chinese. With as secret ingredient: applesauce. So for future preparation: I’m covered! Cut the onion and garlic fine. Heat some oil in a soup pot. Add the chicken cubes into the soup pot and bake for 3 minutes. Then add the onion, fry for 3 minutes and add the garlic. Fry the garlic for a moment (not to long otherwise it would become bitter). Add the tomato puree with the chicken onion mixture and stir-fry the puree for about 2 minutes until it no longer smells sour, but slightly sweet. Pour the sifted tomatoes and stock with the chicken and grate the ginger into the soup. Add the sweet soy sauce, ginger syrup, applesauce, vinegar, sereh and salt. Mix well. Stir the cornstarch with the cold water, add to the soup and bring to the boil, while continuing to stir until the soup thickens. When the soup thickens, put the heat low. 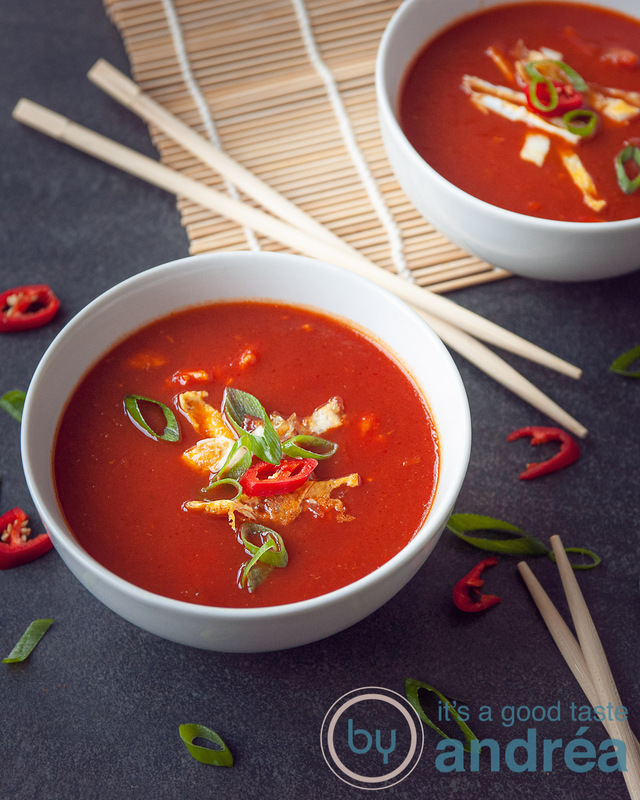 Taste and if necessary season with some extra sugar (tomatoes differ in sweetness and sometimes it may be necessary to add a little extra sugar to get the sweet Chinese tomato soup taste). Meanwhile heat some oil in a frying pan and bake 2 thin omelets of each egg, by whisking the egg and spread the egg as thin as possible over the bottom of the frying pan. Use 1 egg at a time to get the omelette as thin as possible. Roll the egg up, and cut it into thin strips. Slice the onion into strips. Pour the soup into a bowl and add the onion and omelette strips. 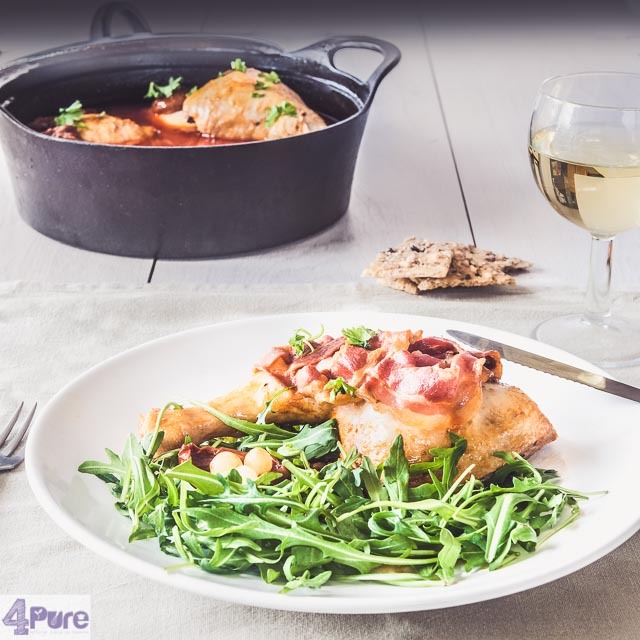 The sister of the famous recipe with chicken: coq au vin blanc. Fresh, sparkling flavors and very delicious! Because of the added herbs and vegetables it got a lot of flavors. A recipe for coq au vin blanc as the French say or just plain chicken in white wine (doesn’t sound that great isn’t it). It’s a variation on the classic coq au vin which is made with red wine. In this recipe white wine is used instead. I’ve added some bacon, veggies and herbs to give it even more flavor. The chicken was so done, the meat fell of the bones. Tip: serve this with a salad and some potatoes. Use a pan which is suitable for oven baking (like cast iron) and add a dash of oil. Add the bacon and bake until it's golden brown. Take out the bacon and put aside on a plate. Sprinkle salt and pepper on the chicken legs and bake them on both sides for about 4 minutes on high heat until they're golden brown. Take the chicken out and place on a plate. Turn the heat to medium and add the small onions, sun dried tomatoes and tomato paste and bake everything for 2 minutes (keep stirring), until the paste smells sweet instead of sour. Add the white wine and stock to the pan and bring to a boil on high heat. turn the heat low and return the chicken legs and bacon to the pan. Put the lid on the pan and let it stew in the oven for 25 minutes. Tip: make this recipe in the slow cooker by following the recipe until step 8. Place everything in the bowl of the slowcooker and turn it on on low heat for 5 - 6 hours. Spinach is packed with vitamin C and iron, there was a reason that Popeye ate cans with spinach. This spinach meatloaf casserole is therefore tasty and healthy. It’s a feast! Thursday is a crowds day. And I do believe that I rained wet for five times today. And because of the icy wind it was not pleasant at all. I shivered all day (and still am not quite warmed) and I drank a lot of tea. And so I was quite looking forward to this dish of spinach meatloaf casserole. Quickly ready and very tasty. Peel the potatoes and cook them in a layer of water in 20 minutes. Meanwhile, heat the milk and butter. Mash the potatoes and stir in the hot milk and butter. Chop the onion and fruit them (about 3 minutes). Add the minced beef and bake it until it is nicely browned. Spoon in the tomato puree and cook for 2 minutes. Add the spinach to the meat in the pan and stir well. If it is still a bit wet, bake a while until it gets drier. Spoon the chopped spinach mixture on the bottom of a baking dish. Add the mashed potatoes on top of it and smoothen the top. Spread the cream cheese over the potatoes and sprinkle with breadcrumbs. Lasagna, the super tasty Italian dish, and you can make many variants. This variant with smoked chicken and mascarpone tomato sauce is delicious creamy and extra delicious by the spinach. We eat at least once a week a recipe from the Italian kitchen. Minimal, because I’m quite fond of it. Luckily for me, there are more people (unlike Indian curries) who like Italian food. What I like a lot is homemade lasagna. Of course the original with Bolognaise sauce is delicious. The recipe I have therefore previously blogged here. But this variant I bake a lot too. Delicious salty chicken, combined with creamy mascarpone and spinach. A whole different flavor and just as tasty. Of course I share that recipe also with you. I hope you find it just as tasty! Grab the frying pan and add a little olive oil in it. Put the pan on a large pit on low heat. Add the onion and cook 3 minutes. Stir with the wooden spoon carefully and cook the puree about 3 minutes. Then smell if the tomato is good. If it smells sour it must bake a little longer, otherwise it's ready. Spoon in the collected herbs, sugar, the peeled tomatoes and sieved tomatoes. Top with the bay leaf. Put a lid on the pan and let simmer for 20 minutes. At salt and pepper at taste. Remove from heat and stir the mascarpone through the tomato sauce. Spoon half of the spinach in the oven dish and spread half of the smoked chicken on top. Spoon 1/3 of the mascarpone tomato sauce in the baking dish. Repeat this last three steps more. Top the dish with the last tomato mascarpone sauce and sprinkle with grated cheese and slices of mozzarella. Bake the oven dish for 30 minutes in the oven. Delicious Italian food, this creamy lasagna packed into a small phyllo cup. Flavorful homemade bolognese sauce, creamy melted mozzarella and salty Parmesan cheese with Italian herbs. Italian food is real comfort food and for a great lasagna, you can wake me anytime. The fragrant tomato sauce, slightly sweet with minced beef melts away on your tongue. The Mozzarella gives a chewy bite, with that slightly creamy cheese flavor which Mozzarella is known for. And the cheese with Italian herbs with which the container is covered, makes the dish . And all this in a Fyllo dough tray, so you can eat it as finger food. This recipe is as easy as it will get! Put a tablespoon of olive oil in the pan and fry the tomato paste for about two minutes, while stirring. Add the garlic and cook 15 seconds, (make sure you keep stirring). Pour the passata into the sauce and then add the sugar and Italian herbs and turn down the heat. Mix that with the sauce and season with salt and pepper. Halve the fillo dough sheet. Brush with olive oil and push two half sheets in a muffin bowl. Repeat for all muffin cups. Grate the cheese over the bowls and sprinkle with Italian herbs. Bake for 15 minutes in the oven. Serve immediately. Meatballs that are flavored with sage and Parmesan. Floating in a delicious homemade tomato sauce. Delicious when served with pasta. Meatballs and Italian food. When hearing either food I just start to feel good. The recipe I choose to cook from this book, combined those. This could be a match made in heaven if you ask me. And it is indeed a delicious dish. Full of flavor and you also get a delicious sauce for the pasta. Very nice to make and eat. Now you might wonder how I got this delicious recipe. The cookbook gehaktballen (Dutch: meatballs) from Salomée Vidal & Jérémie Kanza was send to me. I‘ve looked at, read and made this recipe and I reviewed the book. As the title of this book says it talks about meatballs. All kind of meatballs made of meat, fish and vegetables. Furthermore, the authors have also paid attention to sauces, side dishes and desserts. What was my opinion of this book? The price value is fine. The book is not thick, but the price isn’t to high either € 8.99, for example at bol.com. For that amount you get 27 different meatball variations with: off course beef, but also with ingredients like tuna, eggplant, quinoa, chicken and veal. This produces very nice and unusual combinations which when reading, looks terrific and given the positive experience with the selected recipe I expect delicious flavorful dishes. The pictures are all beautiful in color and the food looks very appetizing. It is also nice that the book got a hardcover so it will remain in a better state for a longer time. Yes, for me is that surely is the very small font in the book and also the ingredients list I find somewhat unclear. This is because there wasn’t a bulleted lists and sometimes very long descriptions that are used for specific ingredients. Thus it seems as if you will need a lot of ingredients, while this is not really so. The side dishes and sauces I found were a really nice addition (partly because they are also used in the recipes). In my opinion I wasn’t sure why there was an addition of the two desserts to the book. no bullets in the ingredients list. Heat some oil in the pan and add the tomato paste. Bake for 2 minutes and then add the tomatoes. Mix the spices and sugar through the sauce and turn the heat down. Let the sauce simmer for 20 minutes and then season at taste with salt and pepper. Put some oil in the pan and fry the onion with 1 tablespoon of sugar until translucent. Put into a large bowl. Melt the butter in the pan and fry the sage about a minute until it's soft. Remove from the pan and add to the onions. Add the parsley, bread, minced meat, eggs and Parmesan to the onion mixture and knead well. Then roll small balls (about 4 cm thick) from the meat. In a large saucepan pour you some oil and fry the meatballs until they are brown. Reduce heat to low and pour the tomato sauce over the meat. Additional: sprinkle, just before serving, some extra Parmesan over the meat. While this tomato soup for Halloween might look scary, it is very nice and creamy because of the web. A real delicious soup (even if it is not Halloween). Tomato soup, one of the favorite soups in our house. I’ve already covered a recipe before for rich tomato soup, but this is quite a nice addition to the recipe base. By adding the sour cream into the soup, by using a piping bottle, whereas you create a spiral in the soup and use a skewer to create a web. Therefore, this soup also look looks exciting and it’s great fun as a dish for Halloween (or a very exciting children’s party). My children first looked a little hesitant, but when the youngest (that’s the daredevil in the field of food) had approved they all attacked the soup. We have eaten the freaky bread fingers with the soup and it was a tasty combination. And so we’ve got a lovely lunch. But I can imagine this is a great appetizer to..
For this soup you make a roux. When you make a roux one of the most important things you need to consider is that you have a hot and cold ingredient when diluting so no lumps are made. Let the butter / flour mixture cool and add hot broth or add cold broth to the hot butter / flour mixture. If you make a vegetarian creamy tomato soup you can add sliced sundried tomatoes as a filling. This soup can be made a day before you eat it. Let cool to room temperature, but make sure that when you’re cooling it is not airtight sealed and when cooled down you’ve got to store the soup in an airtight container in the refrigerator. Warm it just before serving and add the sour cream when serving the soup. Freeze the soup in the fridge for a maximum of 3 months. Add the flour in one addition while stirring with a wooden spatula. Fry the flour 2 minutes, keep stirring, but don't let it brown. Gradually add the cold broth, while stirring with a whisk, so you don't get any lumps. When all the broth is add, bring it to a boil. In a frying pan bake the tomato you 2 minutes (until it smells sweet rather than acidic). Do this so the tomato paste will taste slightly sweet instead of sour. Add the tomato puree to the broth and pour the sieved tomatoes in. Bring everything to a boil again and simmer for 5 minutes. Season with salt and pepper. Draw lines from the center to the outside with a satay skewer. The spiral will form a web pattern in the soup. Besides a strong preference for Indian food, I have another weakness: Lasagne. Delicious that Bolognese sauce combined with dough and cheese. However, there is one thing I absolutely can not appreciate: a thick layer of béchamel sauce. Yes I know it officially belongs in this dish, but it’s just not my thing. I personally find it such a waste of the tasty lasagna. Of course I make the lasagna from scratch. Want to know how? Look at the recipe below! cheese : aged chees or mozzarella. Grab the frying pan and put a little olive oil in it. Put the pan on the stove on low heat. Add the onion and bake for 3 minutes. Then add the garlic and cook for another 2 minutes. Turn off the heat. Grab a skillet. Open the cans of tomato paste and put them in the skillet. Put the skillet on the stove on low heat. Stir with spoon carefully about 3 minutes. Smell if the tomato paste is done. If it still smells sour, it must still bake a bit longer, otherwise it's ready . Then turn off the heat and add the onions / garlic. Grab the frying pan and put it in a little oil. Bake the minced beef brown. Throw in the collected herbs, salt and pepper. Add the tomato/onion mixture with it, the peeled tomatoes and sieved tomatoes. Add sugar and top it with a bay leaf . Put the lid on the pan and let simmer for 30 minutes . Stir occasionally. Spoon 1/3 of bolognaise sauce in the baking dish. Spoon the last bolognaise sauce on the lasagne sheets and sprinkle with grated cheese or sliced mozzarella (or a combination). Set the dish in the oven and bake for 30 minutes. As you might know I’m a participant in the daring kitchen. Why, because we are challenged every month to make, in my case, two recipes which, most of the times we usually don’t make. And sometimes even don’t heard of. And that’s a lot of fun and quite surprising and gave me quite a bit new recipes which I make more often. This month was another time something I didn’t heard of before. 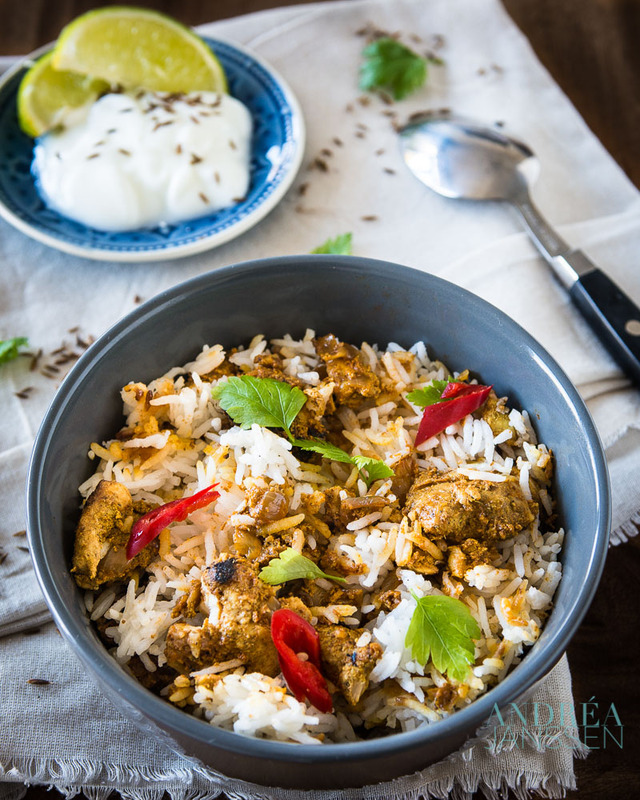 Chicken tika biryani. Yes I’ve heard about chicken tika marsala, but not of tika biryani. But I’m a big fan of Indian food (too bad I’m the only one in my family) so I had a good excuse to put Indian on the table. The end result. My family still didn’t like Indian (because of the spices). However I still liked it. I thought the recipe tasted quite well. So for that matter, nothing really changed. 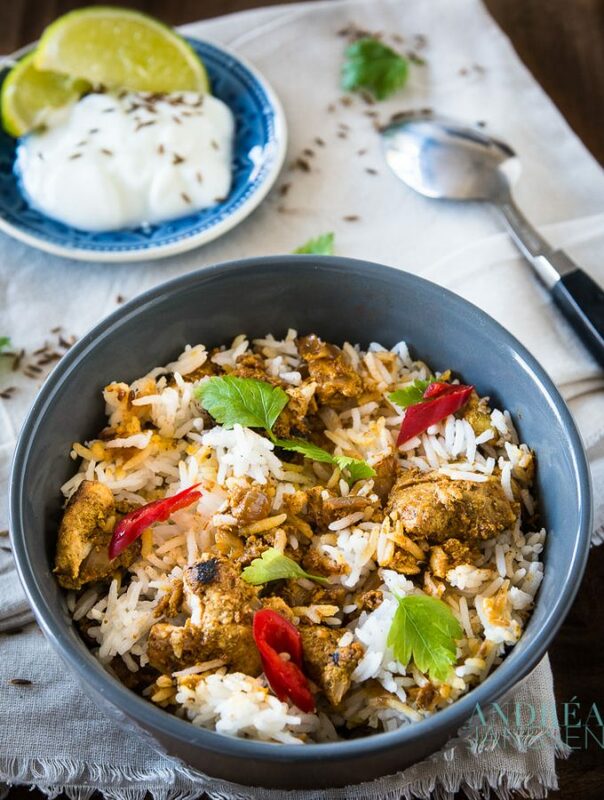 Mix together 1 tablespoon of the tandoori masala powder, ½ teaspoon each of turmeric, curry powder, garam masala, cumin, and coriander powder with the yogurt, lemon juice, half of the minced ginger and garlic, and ½ teaspoon of salt. Cover the chicken with the marinade, cover the bowl and refrigerate for at least an hour or preferably overnight. Melt the ghee with the oil. Add the onions, and the rest of the minced garlic and ginger. Cook on high heat for 5 minutes. Add the tomato paste, 1 teaspoon tandoori masala, ½ teaspoon turmeric, ¼ teaspoon each garam masala, coriander powder, and cumin, and 1½ teaspoon salt. Cook on medium heat for 2 minutes, cover the pan, and cook on low heat for 5 minutes while stirring occasionally. Add the chillies, if using, and the cooked chicken. Cook on medium heat for 3 minutes, then cover the pan and cook on low heat for 10 minutes. Stir in the coriander and remove from heat. Boil the rice with 6 cups (1½ l ) of water, then cover and lower the heat to a simmer for 5 minutes or until the rice is half cooked. Alternate layers of rice and chicken in a large saucepan, starting and ending with rice. Cover the pan and cook over very low heat for 10-13 minutes until the rice is cooked. 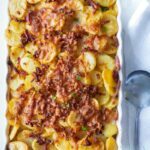 This macaroni is a quick meal (less then 15 minutes) and therefore suitable as a holiday dish. The kids love it when it is served with a delicious salad and fresh fruit. Again a very easy vacation recipe: fast macaroni. You can serve it with some good fruit, cucumber and a salad. Ideal for warm weather. This recipe is a family recipe and the favourite meal for our youngest. When you ask him which meal he chooses as diner, he always chooses macaroni. No french fries, no pizza and no hot dog, but always macaroni. He eats such a lot of it, that he even doesn’t want dessert. So it’s almost impossible to go on a holiday and don’t cook this macaroni for once. Our youngest would be so disappointed. Adding olive oil to the boiling water in which you cook the pasta doesn’t help against sticking of the pasta against each other. The oil just floats on top. If you don’t want sticking pasta add the olive oil when the pasta is drained. When you open a can of tomato paste you can smell the paste is a bit sour. By baking the paste 2 minutes in some oil the smell and flavor becomes sweeter and more delicious. The bacon, ground beef and onion mixture makes the macaroni salty, so it isn’t necessary to add extra salt! This pasta is delicious with fresh watermelon, a delicious salad and / or cucumber slices. Fry the bacon with the onions and then add the minced beef and bake until done. Add the tomato paste and let it simmer gently. This mixture can be kept in a sealed container in the refrigerator until use. Warm the beef mixture in the skillet and when warm add to the cooked macaroni. Cut the bacon in small slices. Put a frying pan on low heat and add the bacon. After 1 minute add the onion and bake for another 4 minutes. Add the minced beef to the onion / bacon mixture and bake it until it's well done. Meanwhile boil water in a big pan. When the water boils add the macaroni and cook as written on the directions on the package. We love to cook it just al dente. Mix the tomato paste with the beef and turn the heat of. Drain the macaroni and add a dash olive oil. Mix very well. Then add the beef mixture and again mix very well until every macaroni piece got a nice orange/red colour. Do you also know a famous recipe, which you’ve heard a lot about, but you’ve never prepared (or tasted) it. 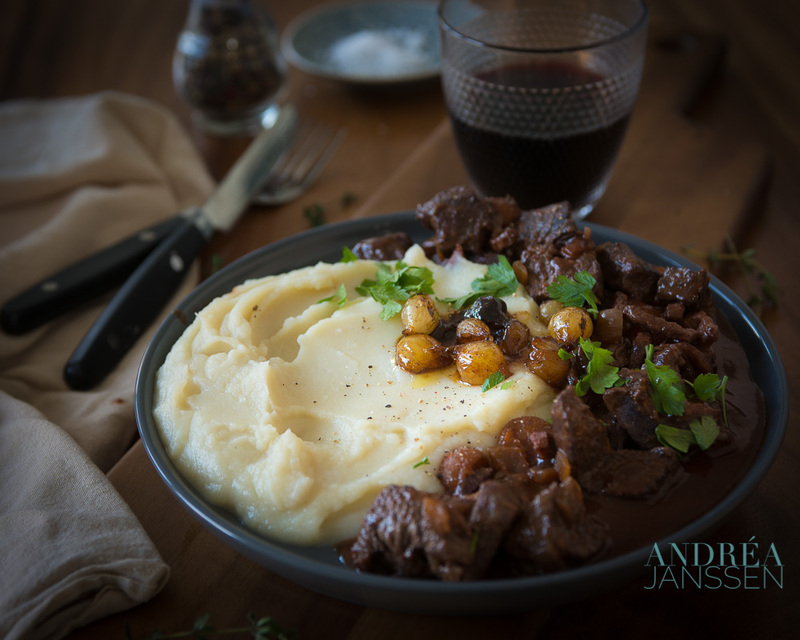 Mine famous but unknown recipe was Boeuf Bourguignon. So this was really a recipe I wanted to make once. It’s a recipe with large quantities of ingredients and a very long recipe (see below), but you can freeze the leftovers (if you have them) so you just have to heat them up the next time. It tasted delicious. The meat was beautifully tender and the onions and carrots had a delicate flavor. I can completely understand why this is such a famous recipe. Just not in May with glorious sunny weather, when this Daring Kitchen challenge was given. I thought it was more of a winter dish. I adjusted the recipe by not adding any mushrooms because of my allergies. And I haven’t noticed something missing, it is such a delicious recipe. Pat the beef steak dry with paper towels. Heat the oven to 230 degrees Celsius. Add the bacon to a casserole (oven resistant) and fry on low heat. Remove the bacon with a spoon and add the meat. Bake it, and then set aside. In the remaining oil, fry the carrot and onion for 2-3 minutes. Add the bacon and the meat again. sprinkle with salt and pepper and flour and stir well. Put it for 4 minutes in the oven, so the meat gets a delicious crust. Remove the pan from the oven and add wine, broth, tomato paste, garlic, thyme and bay leaf. Stir well and cover the pan with a oven proof cover (and if you don't have it use some aluminum foil) and place the dish in the oven. Reduce the oven to 150 degrees Celsius, and allows the casserole to simmer for 3 to 4 hours in the oven. While simmering in the oven prepare the small onions. Melt a tablespoon of butter in a pan and fry them until golden brown. Next, add as much broth until the onions are just covered. Let it simmer without a lid for 20-25 minutes, until almost all the liquid has evaporated and the onions are nice and soft. Set aside. When the meat is tender, grab a bowl and put a coarse sieve on top. Pour the stew through the sieve (be sure to catch the fluid in a bowl). Wash the pan and add the meat and the vegetables back into the pan. Pour the strained liquid into a saucepan and spoon off the fat with a slotted spoon. Let the liquid boil on high heat for 2-3 minutes. Pour the liquid with the meat and leave the casserole into the oven for another 2 to 3 minutes to heat everything. It is a delicious dish to serve with potatoes, spaghetti or rice.